No software upgrade need it. Free Shipping within USA, lowest price guarantee & Software Upgrade Service option available. Why are you still paying TWO phone bills each month? Keep the cell phone service and stop paying for a landline service. The XLINK BT pays for itself in the short months! XLINK BT the next generation of Bluetooth® based product. Turn your home corded and cordless phones into a cellular multi-line phone system. The XLINK family of products make it possible to send and receive cell phones calls using regular telephones. No more searching for your cell phones just use regular phones at home or in the office. 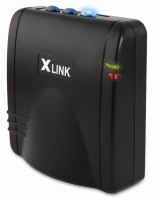 The XLINK BT Cellular Gateway connects three cell phones to regular telephones. After setting up the XLINK you can use regular phones to make and receive calls over any of the three connected cell phones. 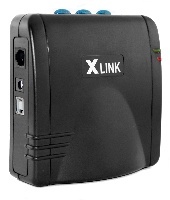 The XLINK BT can be used at home or the cottage, on the your boat or RV, or anywhere you use your cell phones. Using Bluetooth® wireless technology, the XLINK BT communicates wirelessly with your cell phones. There are NO extra cables to buy. Whenever your cell phones are placed within range, the XLINK BT will automatically connect to them. There are no additional monthly fees to use XLINK, simply set it up and start to use it. Your regular cell phone fees will still apply. Yes, you can access your Voicemail by going off the hook, then pressing the '1' then '#' keys on a telephone that is connected to XLINK. This connects you to your Voicemail service, similar to pressing and holding the '1' key on your cell phone. If this does not work automatically, you can still access your Voicemail from any telephone in the house. You just need to store your Voicemail number into XLINK. See the user guide 'link' for details. Yes, each cell phone has its own line number from 1 to 3. You can select the line you want to dial out by pressing the line number and then the FLASH button on your regular phone. Each blue button on the top of the XLINK is a cell phone line number. The dots indicate which is line 1, line 2 or line 3. When you select a line and hear dialtone, you can proceed with your call. If you hear a series of rapid tones, it means that there is no cell phone currently connected to that line. Try another line that has a cell phone paired and connected to it. Yes, you can use cordless phones with XLINK. Some 2.4GHz cordless phones may cause interference with the Bluetooth signal. XLINK is equipped with the ability to avoid the same channels used by 2.4GHz phones to minimize any interference. Yes, you can pair and connect up to 3 bluetooth enabled cellphones to XLINK. When any of the connected cell phones ring, all the phones in your house will ring. When a cell phone is ringing, a blue light will flash to show you which line is ringing. You can answer any of the lines from any extension set. An extension set is any regular corded or cordless telephone that is connected to the XLINK, either directly or through the house wiring. See "How to set up XLINK" for details. Many cellphones have voice commands that are accessible from regular telehones through the XLINK. Press ## to enable the voice commands. Usually there will be a beep. After the beep you can say the voice command. No, you can keep your landline and use the XLINK as line 2, or simply plug a multi handset cordless phone into XLINK. You can also look in your user guide in the table of contents or the index section that is typically in the back of the user guide. You can also look in the menu of your cell phone. It is usually found in the 'Settings' menu, under 'Connections'. If you cannot find it, try looking for your phone model on the website of your service provider, they will usually give a list of features such as Bluetooth capability. Yes, you will hear a call waiting tone, and see the caller ID (If supported by cellphone). Use the FLASH button to answer the second incoming call. No, you do not require a landline to use XLINK. XLINK uses your cellphone service. This means you have plugged the XLINK into an active land line. Unplug the XLINK from all the active telephone jacks. You must use wires that are not used by your local telephone company. The recommended way to use XLINK is to plug a corded or cordless telephone directly into the XLINK and not use the house wiring at all. A multi handset cordless phone is ideal for use with XLINK. If you want to use the house wiring, make sure that you disconnect any active landlines from the wiring. If you do not pair a cell phone to all 3 lines, XLINK will always use the lowest line number for prime line. For example, if you only have a cell phone paired to line 3, then go off hook on an extension set, line 3 will be the prime line. If you have a cell phone paired to line 2 and line 3 and go off hook on an extension set, line 2 will be the prime line. It is a good idea to pair the cell phone you will use the most to line 1. A great product. Use at our weekend house. I had already modified the house phone wiring for Vonage, unplugged from Vonage adapter and into X-Link. Set-up less than 5 minutes. My wife did not like the quality of MagicJack but is fine with the quality of X-Link. No problems with call drop outs or noise. It is as good as your cell connection. Am saving $250/year. What's not to like! Ordered on a Sunday, received on Wednesday.Great service.